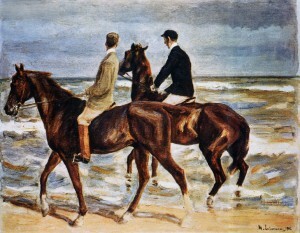 To date, only one lawsuit has been filed in the United States related to the seizure from Cornelius Gurlitt’s apartment of some 1,280 works of art, a story that broke a year ago with the concern about the objects’ Nazi-looting connections via his father Hildebrand Gurlitt (the view here last winter was that the longer Germany failed to address the situation comprehensively, the more likely such U.S. litigation became). 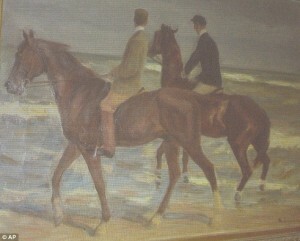 That lawsuit, brought by David Toren, seeks the return of Two Riders on the Beach (Zwei Ritter am Strand), by Max Liebermann. Germany and Bavaria moved to dismiss the case yesterday, which is particularly puzzling given that among the very few determinations made by the Gurlitt Task Force (in August), it is that the Liebermann should be returned. The cynical view is that they are looking to forestall future claims, but it is past time for the painting to be returned. When I spoke in Heidelberg in January at the Institute for Jewish Studies conference “Appropriated Art—the Gurlitt Case,” one of the points I stressed in discussing U.S. restitution litigation was that the longer the Gurlitt case went unresolved (and do not be distracted by the “Voice of Russia” article that is being circulated as “Holocaust victims’ heirs to reclaim Nazi-looted artwork if Gurlitt bill passsed”­—it is not remotely a simple or likely as that), the more certain it would be that litigation would follow in the U.S. Gurlitt himself and his legal team have done their part recently to make any meaningful agreement impossible, and in the absence of unilateral action by Germany (which would probably be illegal), it has now come to pass. The first civil claim related to paintings seized from Cornelius Gurlitt’s apartment has now been filed by David Toren in the U.S. District Court for the District of Columbia against the Free State of Bavaria and the Federal Republic of Germany.